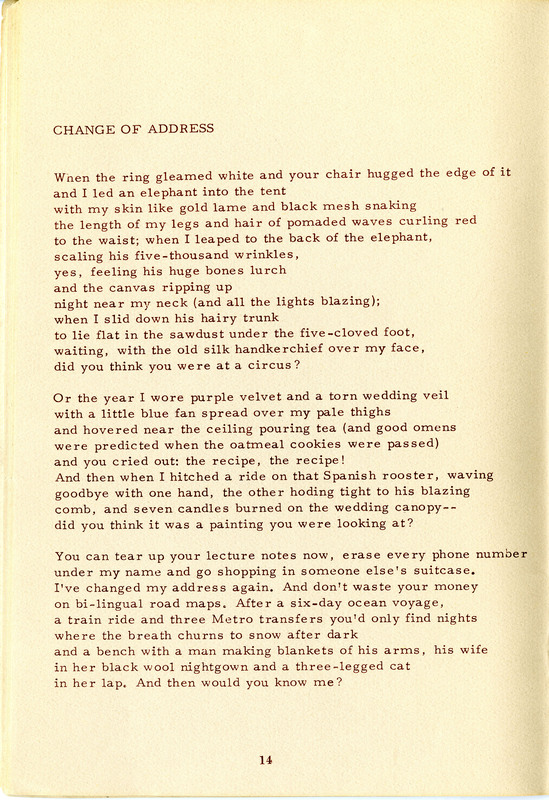 The chapbook Change of Address by Kathleen Fraser was released in 1966, during the early years of the Mimeo Revolution, when small press poetry publishing exploded nationwide. 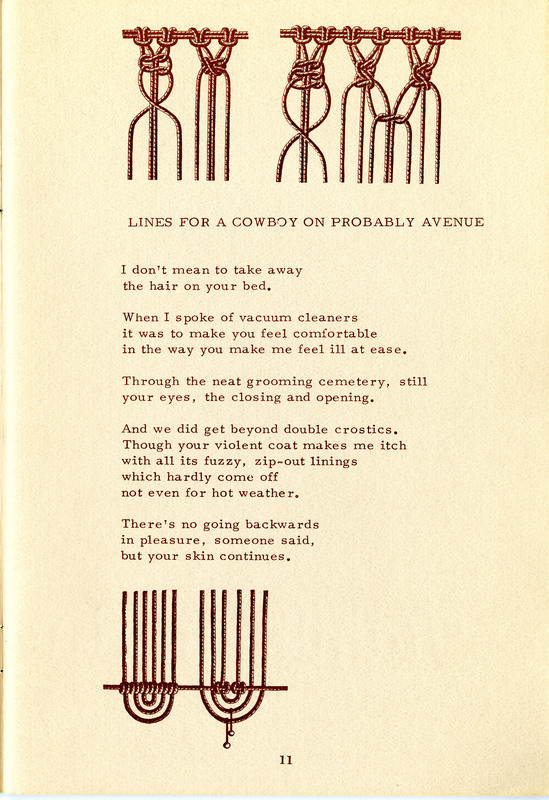 It was published by Kayak Books, a quintessential Mimeo Revolution press—a one-person operation with poet George Hitchcock as editor, designer, and disseminator. 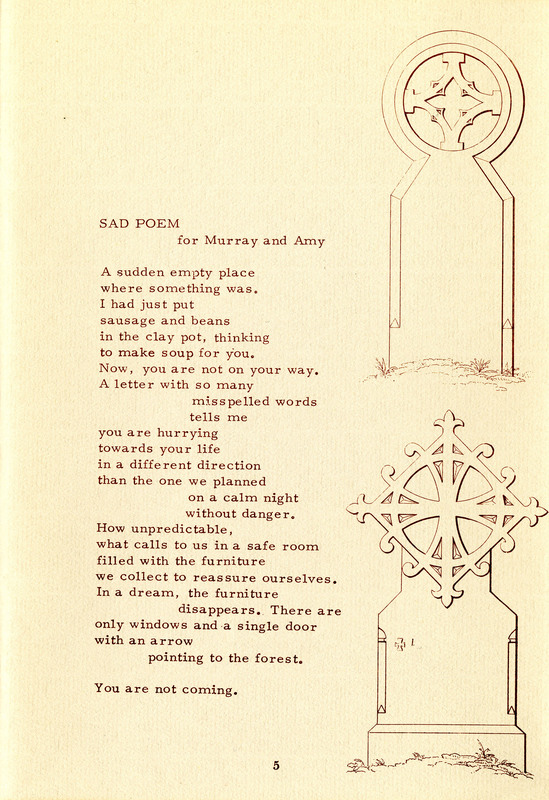 Change of Address epitomizes the ways in which the Mimeo Revolution supported emerging poets and created community—both Hitchcock and Fraser would become central figures of the Bay Area poetry scene. 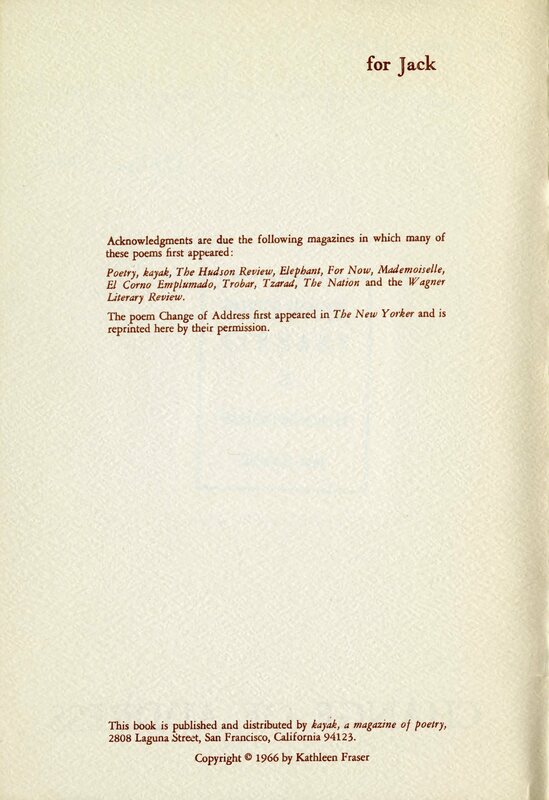 Fraser’s first collection, Change of Address, also provides insight into the early poetry of an influential poet whose work helped to shape feminist avant-garde poetics. 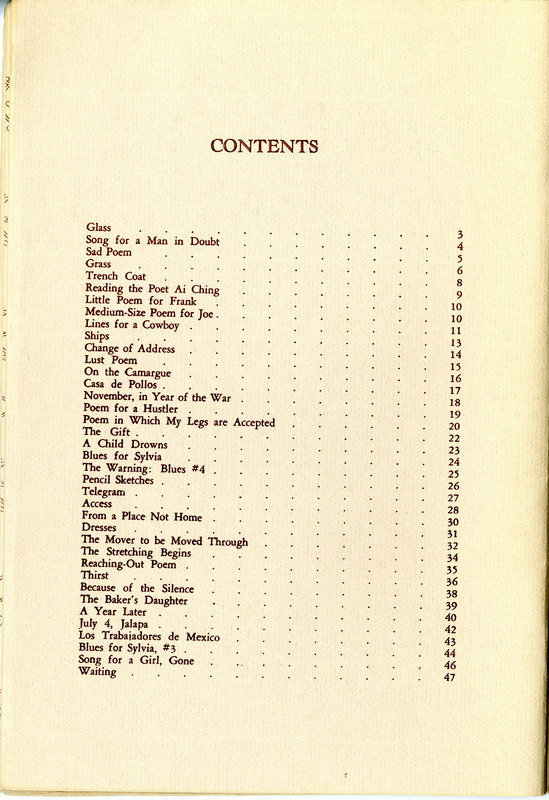 Change of Address was among the first books published by Hitchcock. 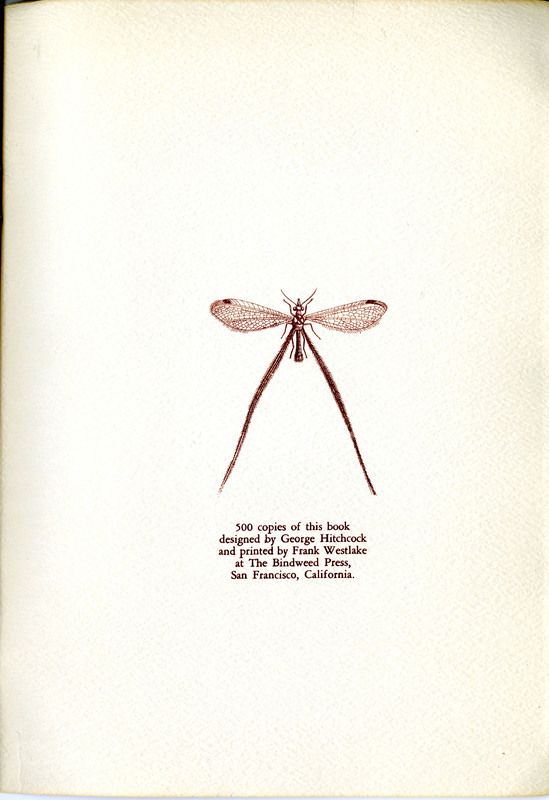 Released in an edition of 500 copies, it was printed, like many of Kayak’s early efforts, at the Bindweed Press in San Francisco run by Frank Westlake. Westlake made a name for himself in the late 1960s printing rock concert and political posters, including those for the Black Power movement. 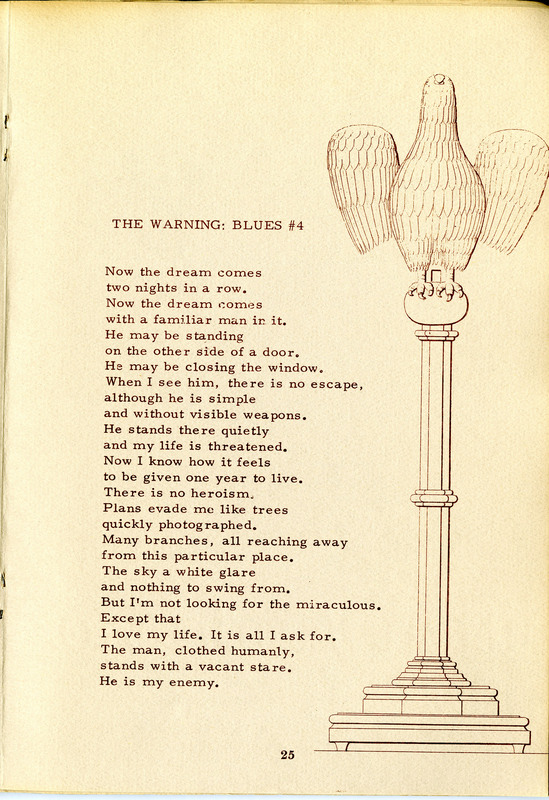 Hitchcock designed Change of Address using what he described as “Victorian Pop Art,” engravings from various 19th-century print sources, as illustrations. 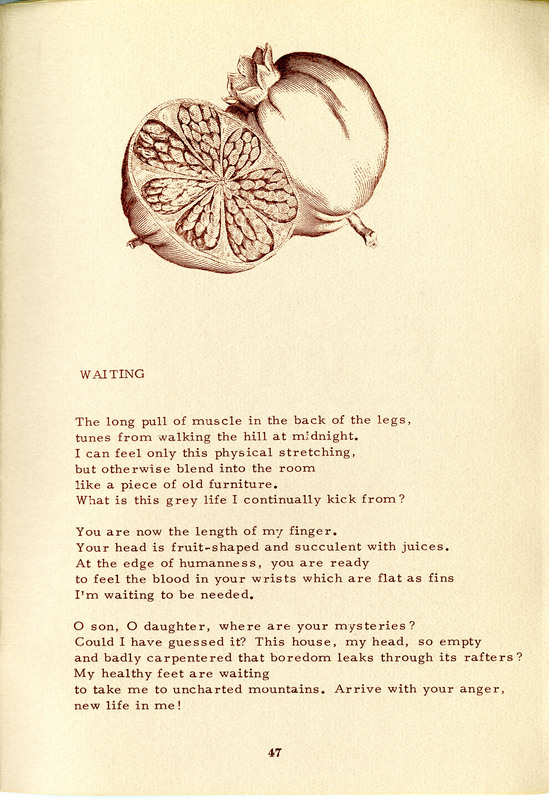 The vintage ornamental images—door knockers and ornate hinges; reptilian skeletons, sea urchins, and birds— juxtaposed with Fraser’s sophisticated 20th-century sensibility, underscore the quiet irony laced through many of these poems. 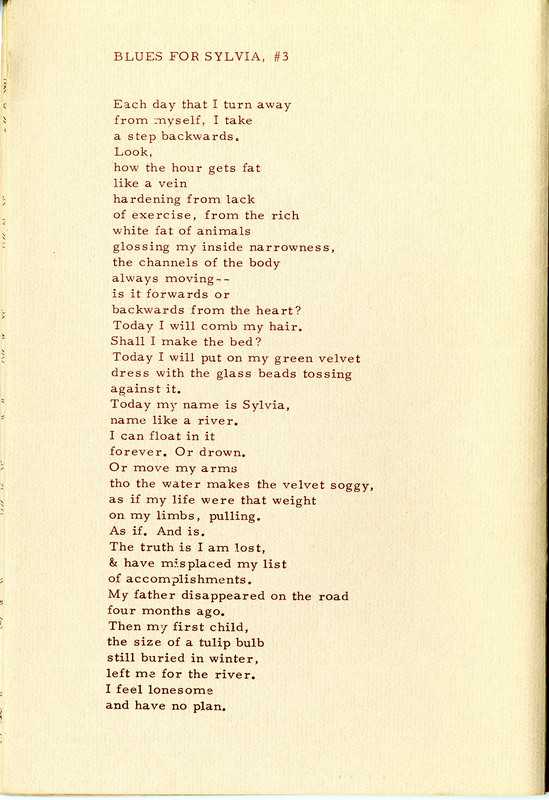 Poets House’s copy bears a handwritten inscription from Fraser to the poet James Wright, whose influential The Branch Will Not Break, demonstrating his own radical shift from formalist poems to Deep Image free verse, had been published to critical acclaim just three years before. 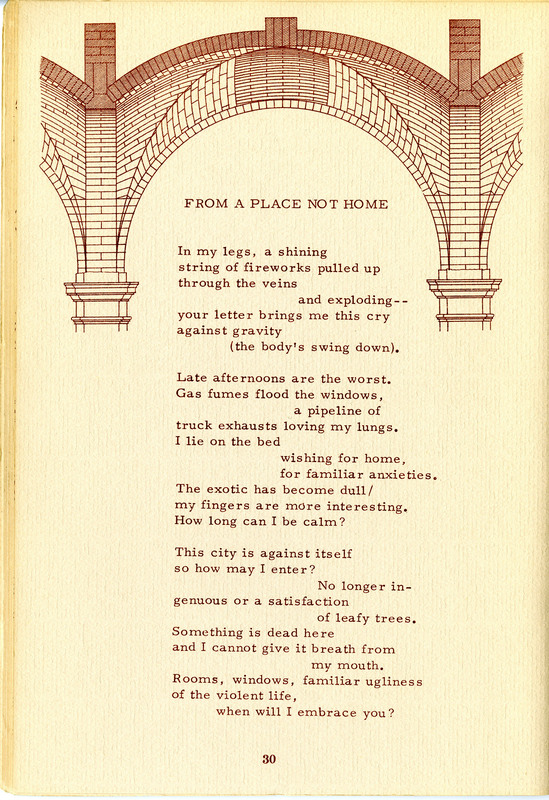 Despite Fraser’s clear affinities with the New York School poets of the 1960s, who combined Surrealist influences with irony and urbane wit, Change of Address provides a glimpse into an early stage in Fraser’s distinct trajectory. 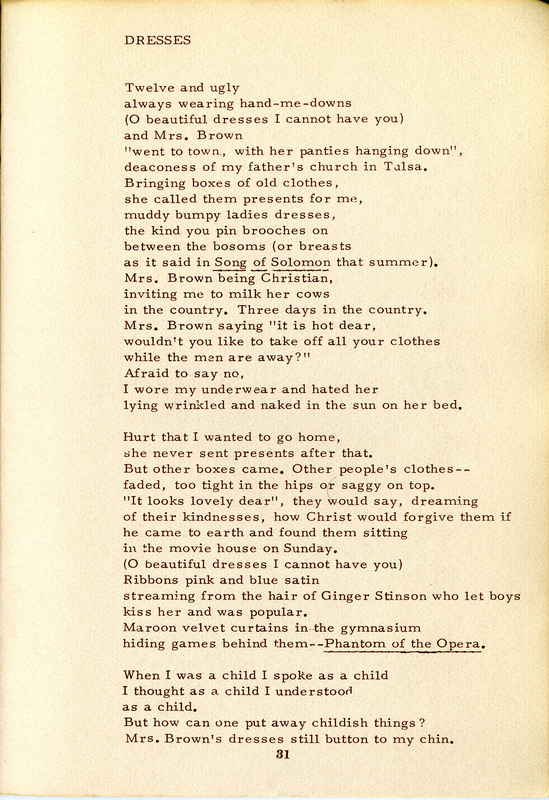 Employing an intimate yet arch tone reminiscent of Frank O’Hara, these first-person, free verse poems often wryly critique patriarchal constructions of female beauty, domesticity, and sexuality, as in “Poem in Which My Legs Are Accepted” and “Lust Poem.” She also pays tribute to poet Sylvia Plath (“Blues for Sylvia,” “Blues for Sylvia, #3”) and Yvonne Rainer, whose postmodern choreography was radically reshaping dance in the 1960s (“The Mover To Be Moved Through”). 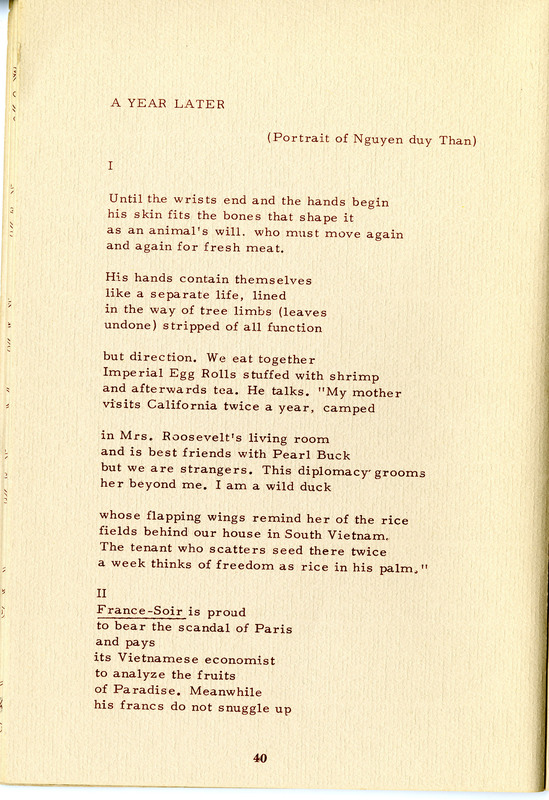 Other poems explore travel, war, and dislocation, including a poem about the renowned poet Nguyen Duy Than, who fought with the North Vietnamese army in the Vietnam War (“A Year Later”). 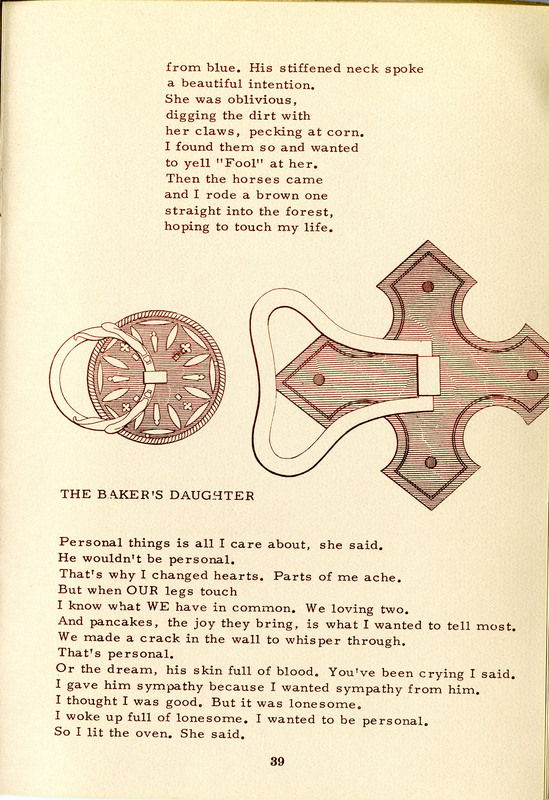 These remarks could be interpreted as signaling a feminist poetics that would become more crystallized in the next few decades. 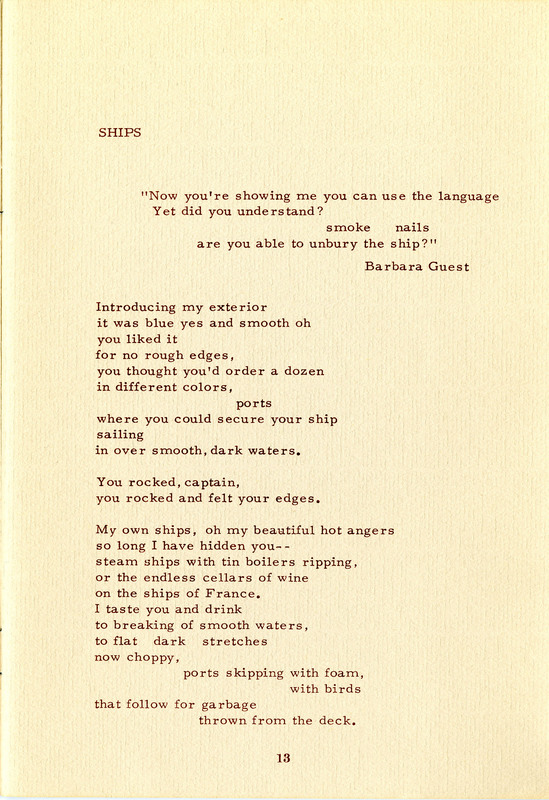 Fraser has described her subsequent struggle in the 1970s and 1980s “to get off of that ‘I’ place that was so prominent for those of us who came into poetry in the 60s.” After Change of Address, Fraser would invent new ways of engaging with the page, experimenting with white space, fragment, and found text to express silences, erasure, and the tentative nature of articulation for women under patriarchy. 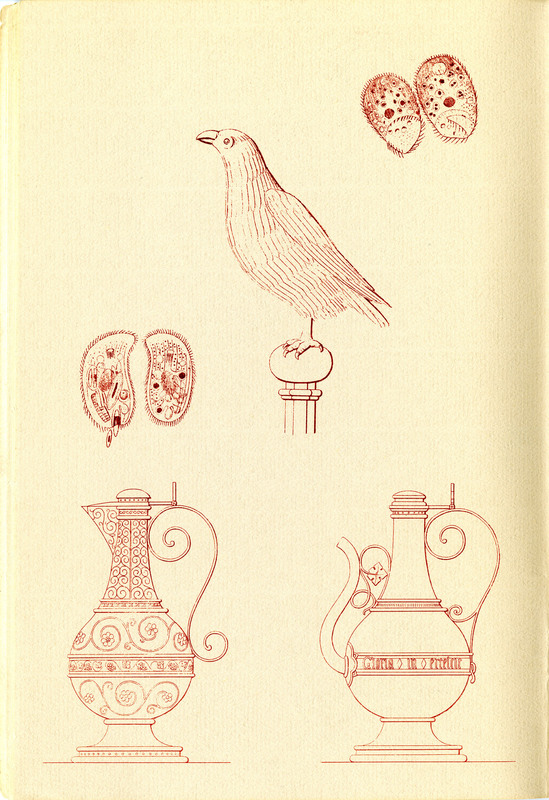 Her later books also use these and other strategies to explore history, visual art, and translation of both cultures and languages. 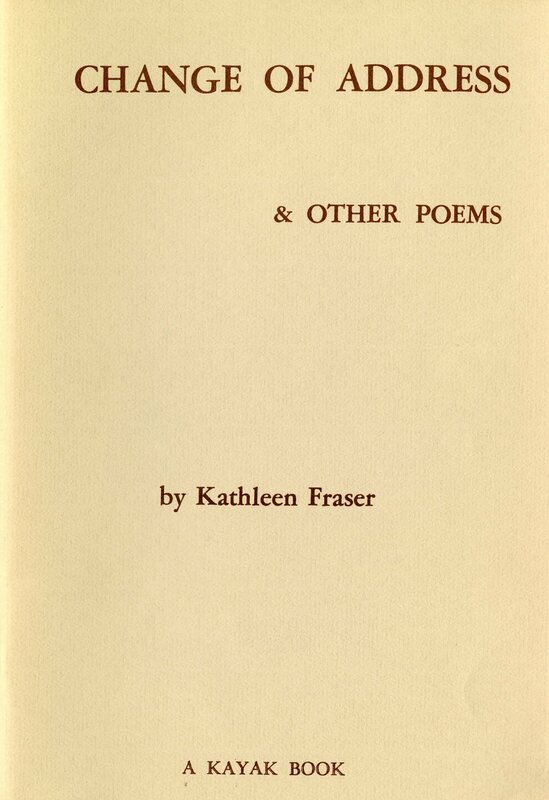 This first book publication demonstrates Fraser’s dexterity as a wordsmith, presages her groundbreaking work in bringing together the politics of gender with poetic experimentation, and points toward a lifelong commitment to investigating new territories of experience and language. 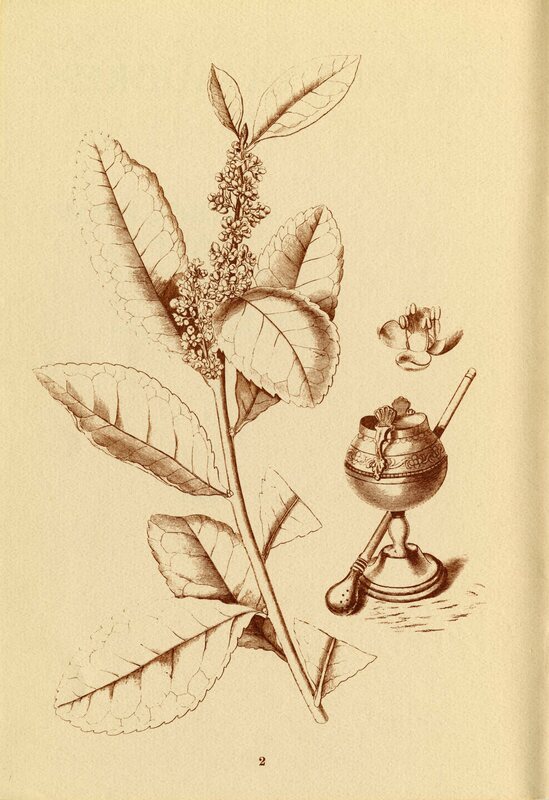 Change of Address is presented on this site by permission of the author. 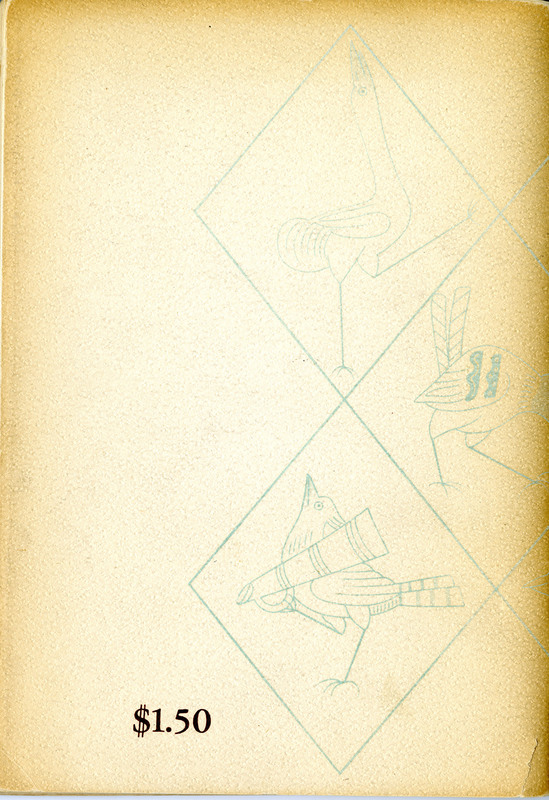 Staying true to that dictum, from her 1993 essay “Faulty Copying,” was at the core of Kathleen Fraser’s writing, a five‐decade practice committed to unveiling new processes and poetic registers. 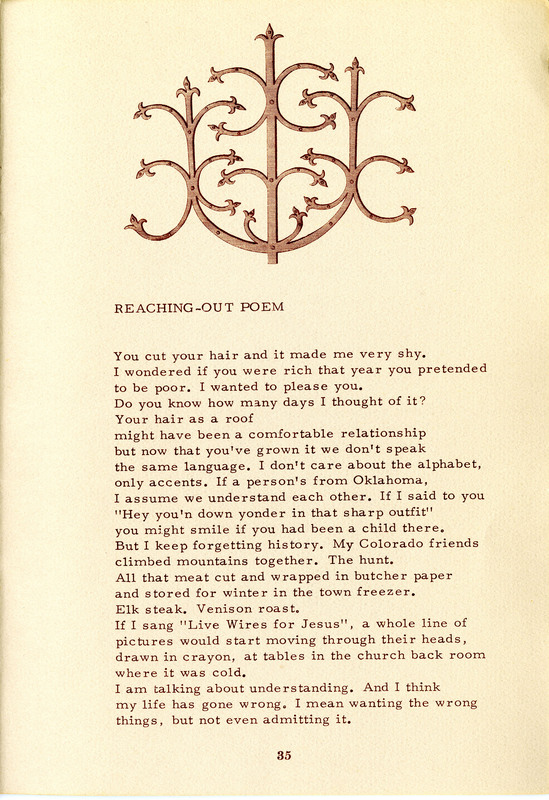 Born in Oklahoma, Kathleen Fraser (1935 - 2919) grew up in a Calvinist family and lived in Tulsa, then in small‐town Colorado, and finally in Southern California, where she attended Occidental College in Los Angeles. 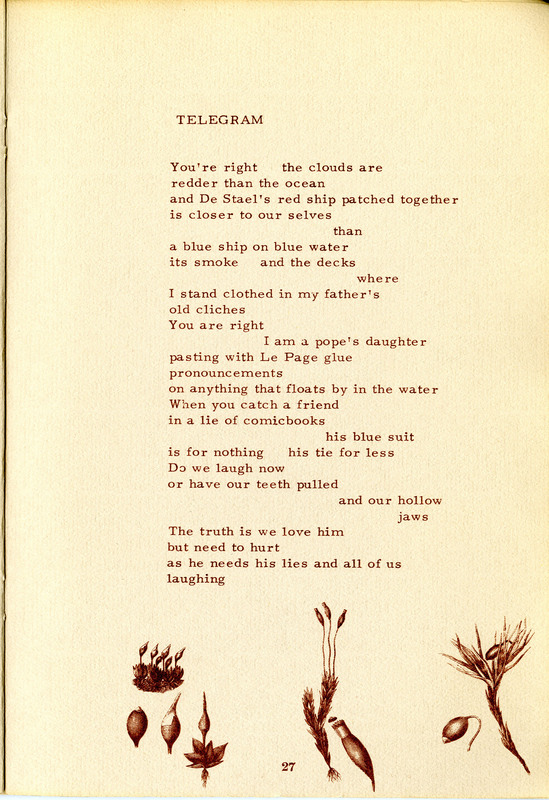 Moving to New York in the late 1950s, she worked for Mademoiselle and took poetry workshops with Stanley Kunitz and Kenneth Koch. 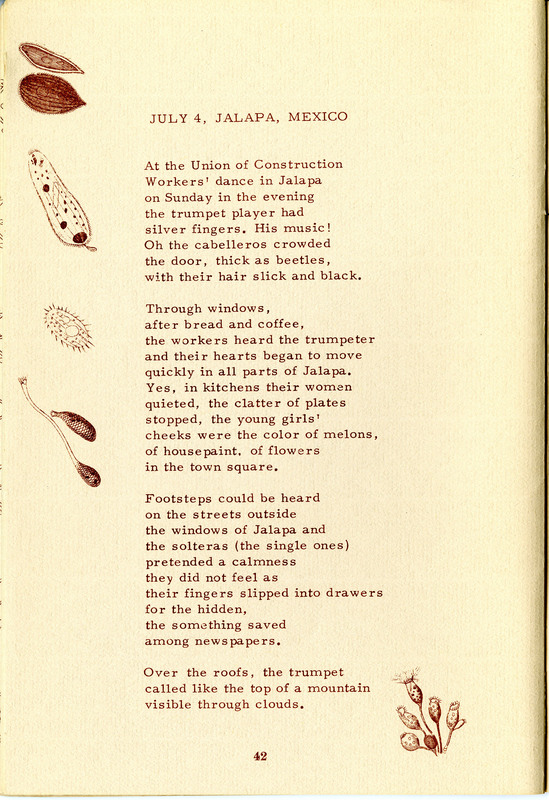 Early influences included Sylvia Plath, Robert Lowell, and Anne Sexton. 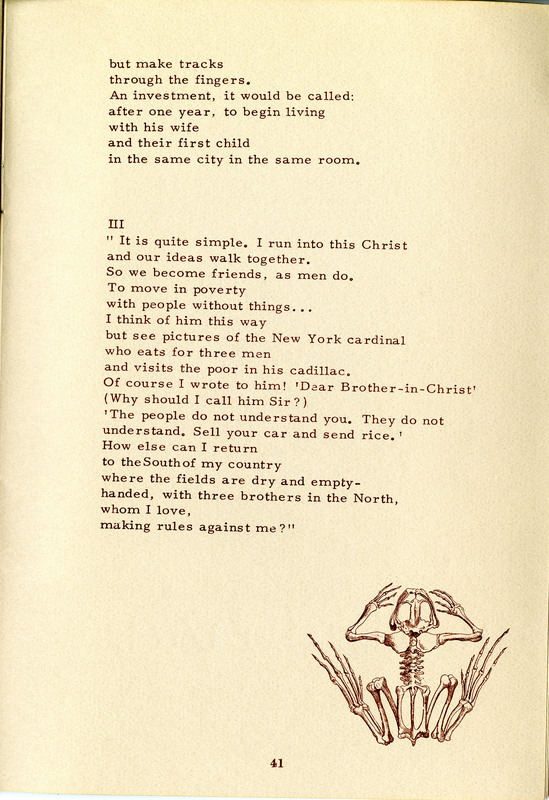 She learned, as she said, how to write a New Yorker poem. 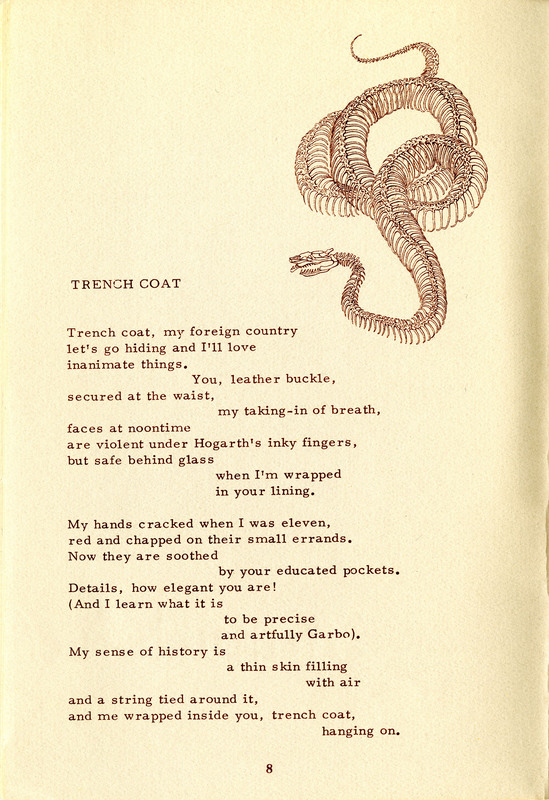 Three of her early poems were published there. 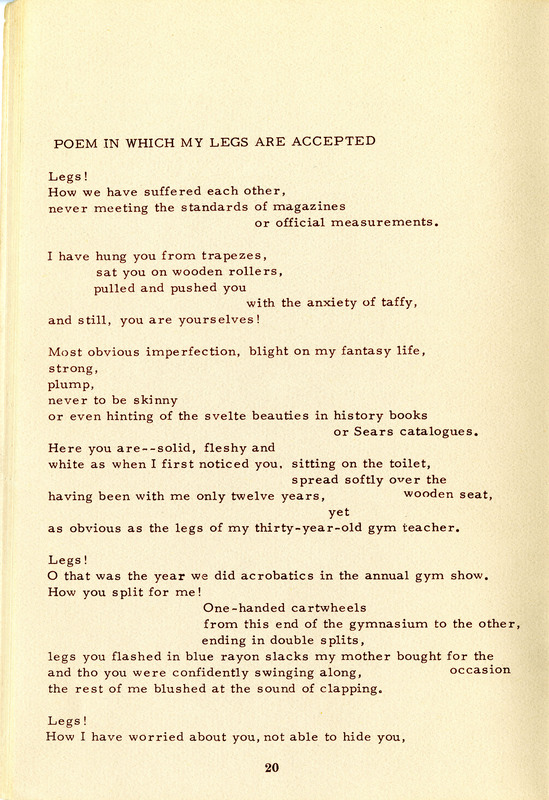 She also met members of the New York School of poetry—a group of poets whose work combined Surrealism, irony, pop culture, and high art. 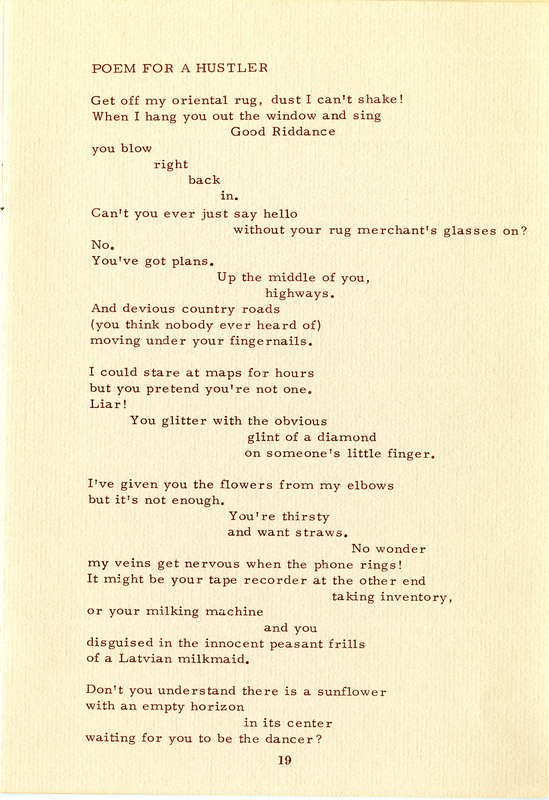 Frank O’Hara and Barbara Guest were especially important influences. 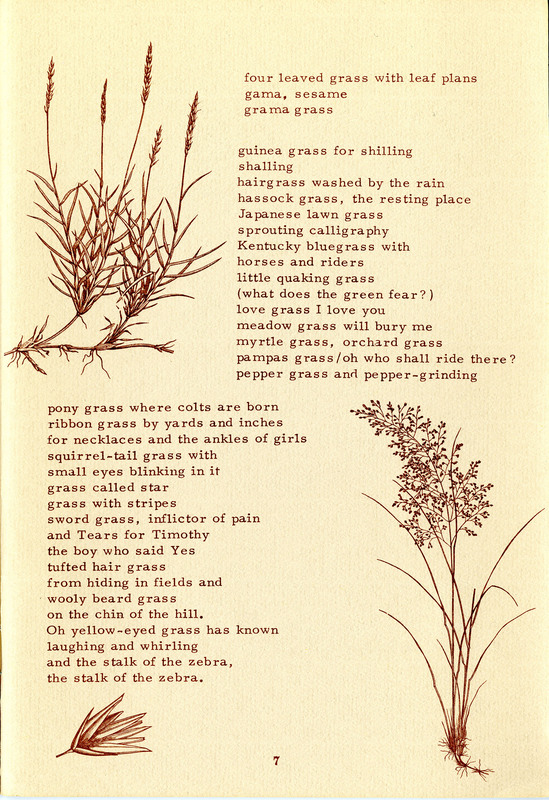 Her stature as a poet continued to rise through the 1960s and 1970s, and she published several chapbooks (the first two with Kayak Books) and then two full‐length collections with Harper & Row. 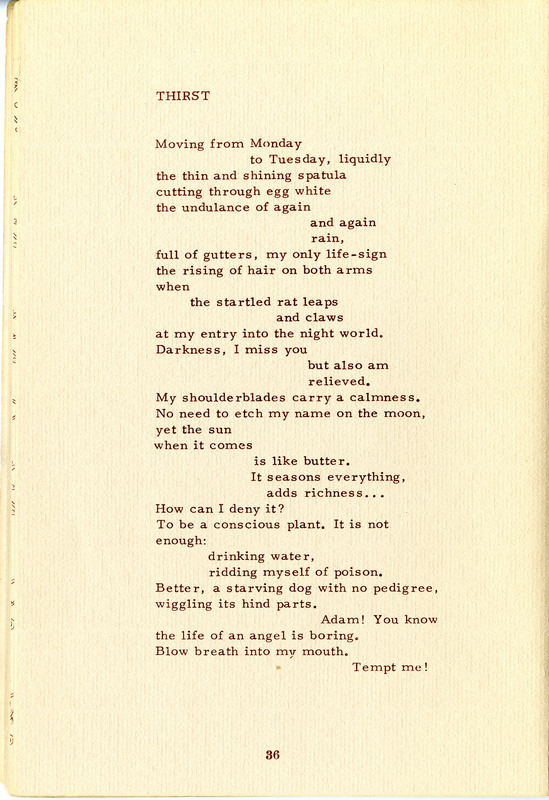 After teaching posts at the University of Iowa Writers’ Workshop and Reed College, Fraser arrived at San Francisco State University in 1972, where she would be a professor of creative writing for twenty years, as well as director of SFSU’s Poetry Center and founder of the American Poetry Archives. 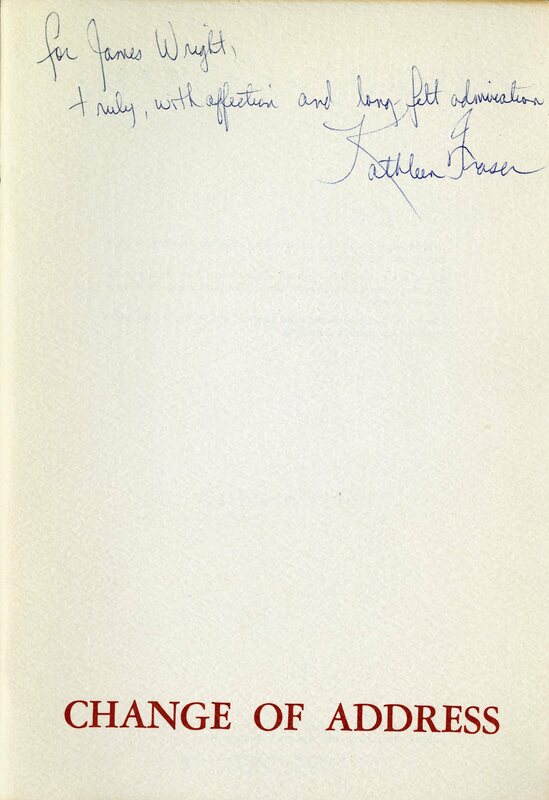 Despite recognition from some of the most established literary publishers in the country, Fraser had already begun moving past the modes of writing that brought her early attention. 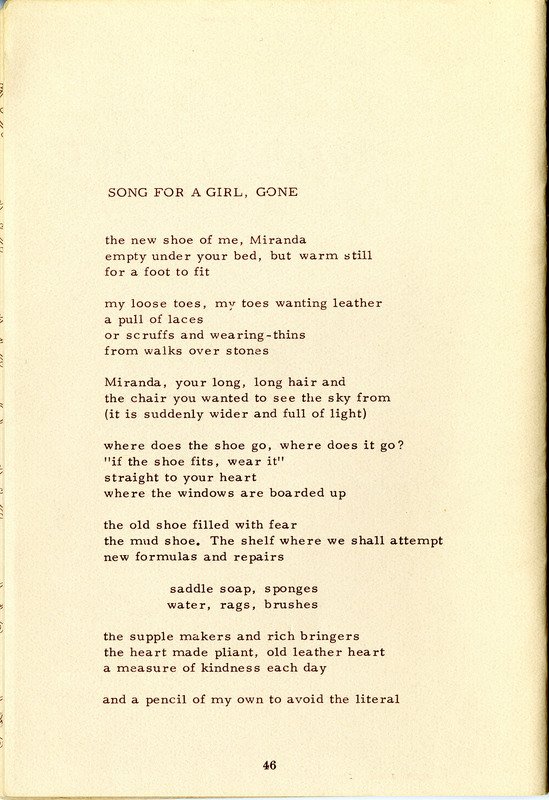 She was eager to leave behind the polished and witty lines of the New York School and embrace, as she describes, “a listening attitude, an attending to unconscious connections, a backing off of the performing ego to allow the mysteries and mind of language to come forward and resonate more fully.” She read deeply the work of George Oppen, Jack Spicer, Lorine Niedecker, and H.D. 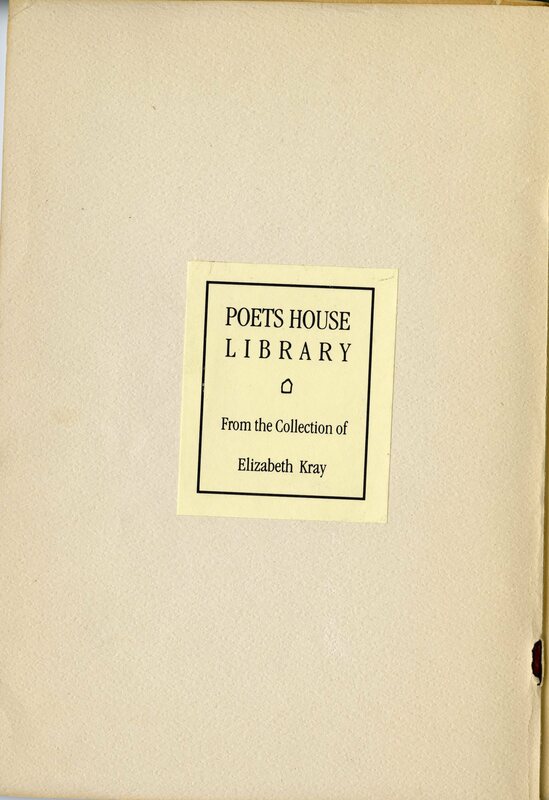 She also began to read and introduce students to other female modernist poets—including Gertrude Stein, Mina Loy, and Dorothy Richardson—who had been omitted from the male‐dominated canon. 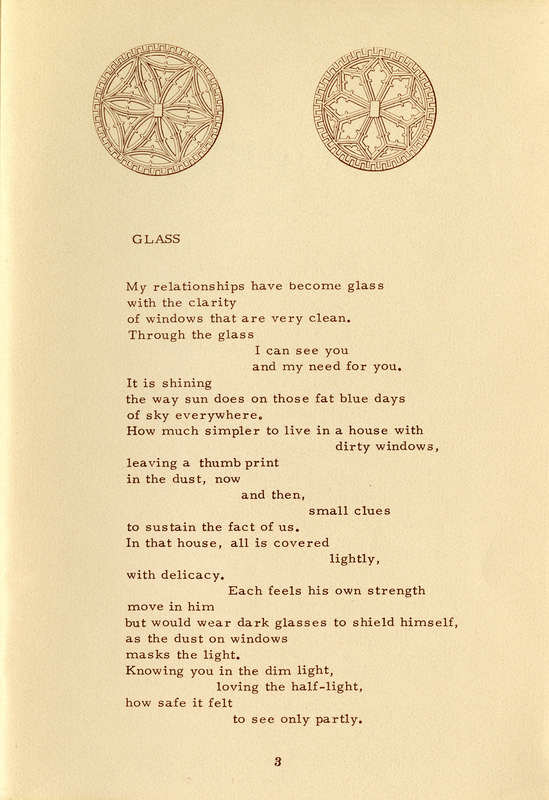 Starting in the late 1970s, the shape and sound of Fraser’s poems began to change, as she discovered her own “poetics focused on syntax and unease.” She experimented with fragment, found materials, and the white space of the page. 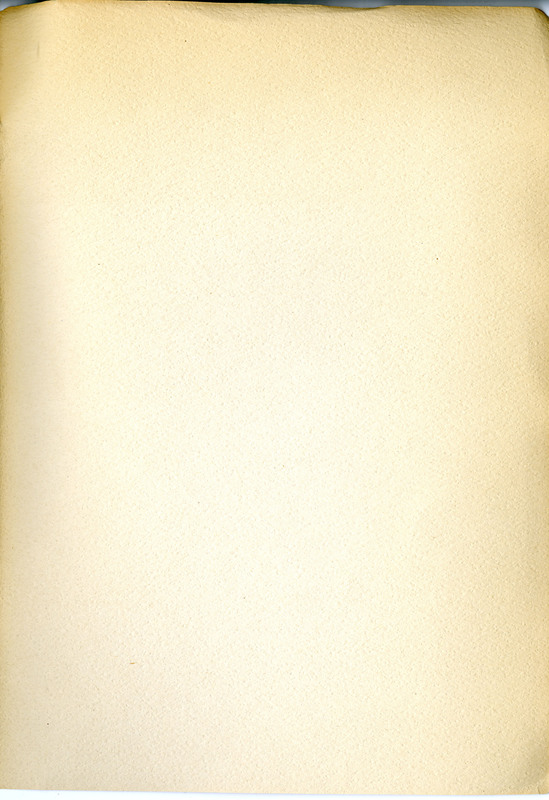 Some of these strategies grew out of feminist thought about the role of silence and erasure in language use for women. 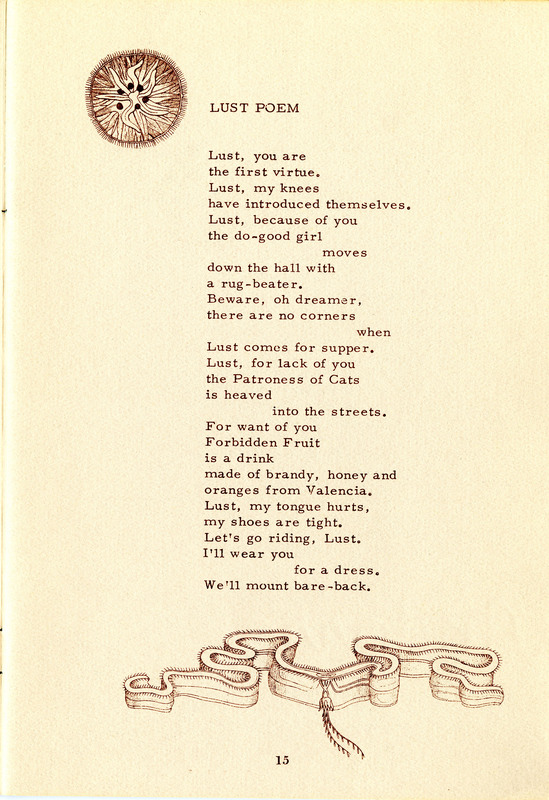 In addition to her extensive work as a poet and teacher, Fraser was the founding editor of the germinal feminist poetics journal HOW(ever), which focused on innovative writing by women poets, both past and contemporary. 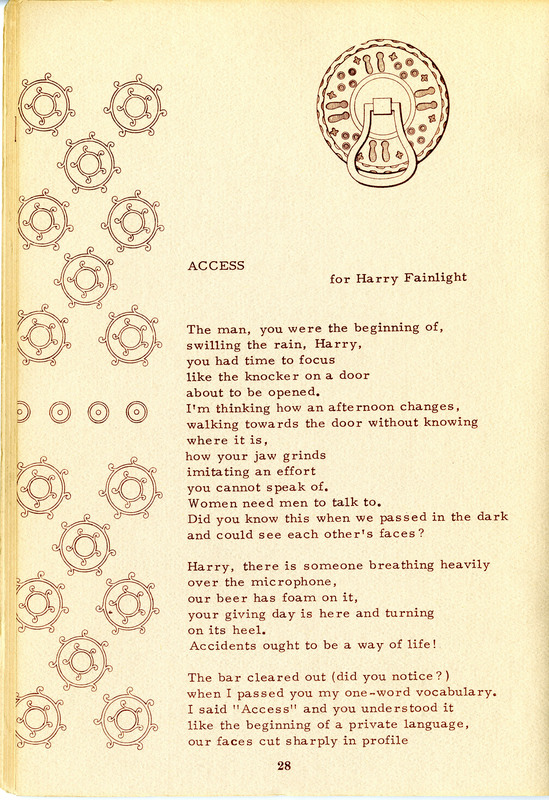 The print journal, which ran from 1983 to 1991, was edited in collaboration with Beverly Dahlen, Frances Jaffer, and, later, Susan Gevirtz. 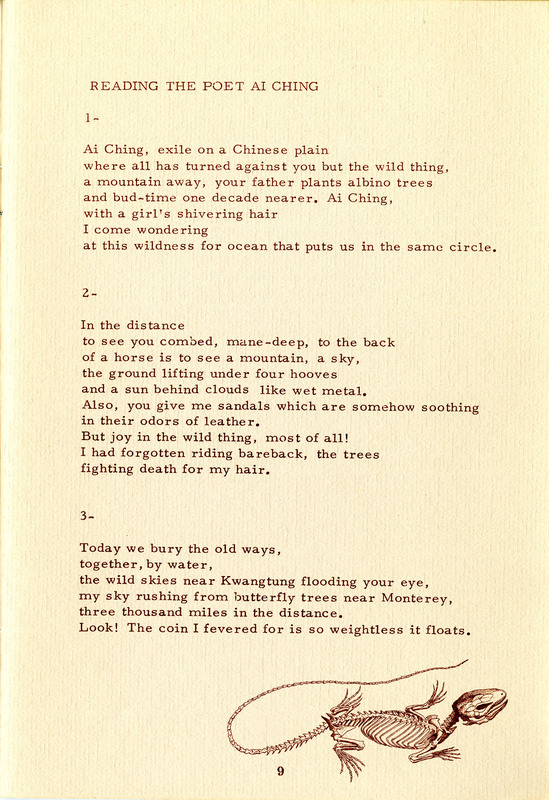 In 1999, an online version, How2, emerged to resume and archive the original vision. 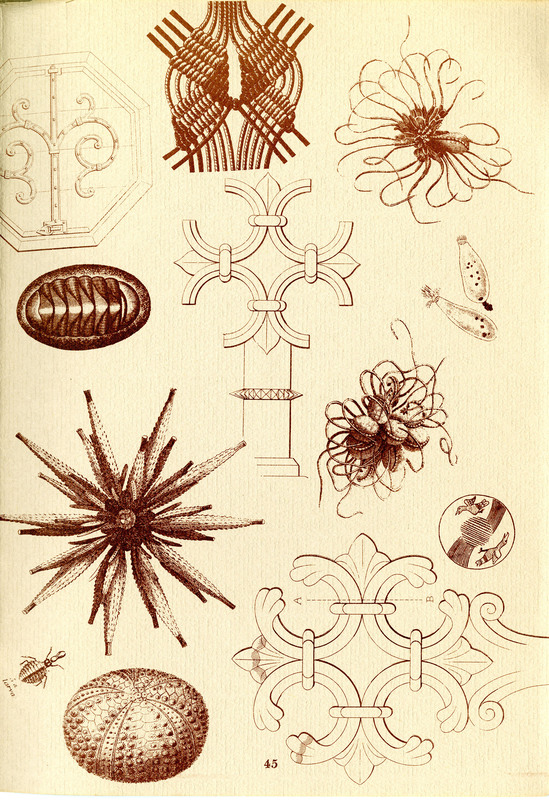 Throughout over a dozen books, Fraser continued to rigorously experiment with language, exploring uncertainty, instability, dislocation, personal and cultural loss, spaciousness, and investigation itself. 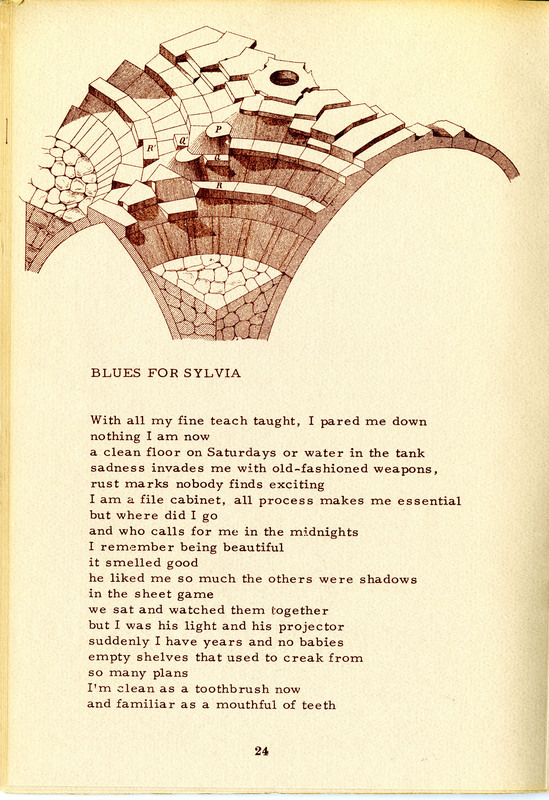 She became interested in the way error might create tension and frisson, as evidenced in her poem “boundayr,” in which a typo makes a new word and becomes the perfect title for a complex poem about color and perception. 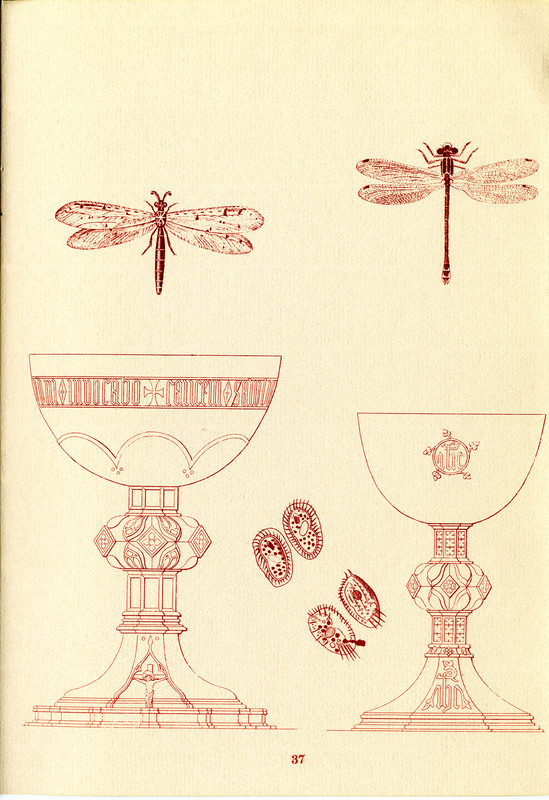 Starting in the early 1980s, Fraser began considering the idea of history in her work, partially as a result of her stays in Italy and her appreciation of Etruscan sites and Giotto’s paintings. 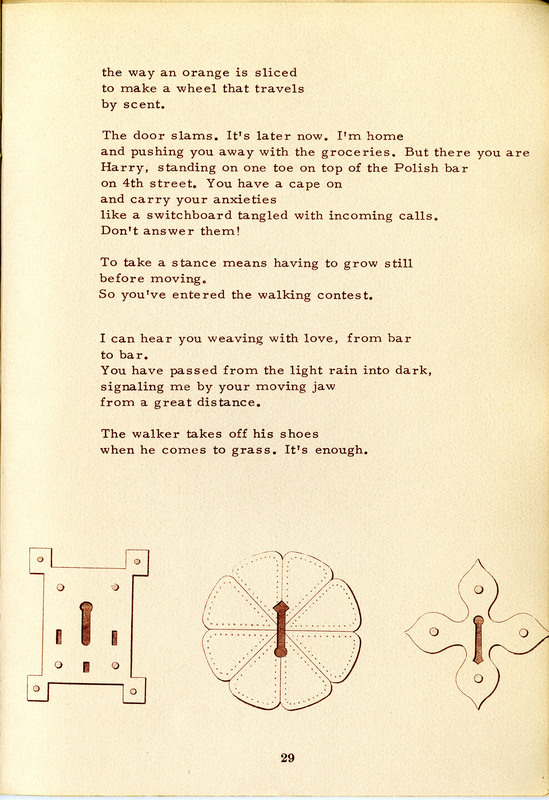 In her late work, she went further into the visual and material quality of language, created her own collages, and undertook ambitious collaborations with contemporary artists. 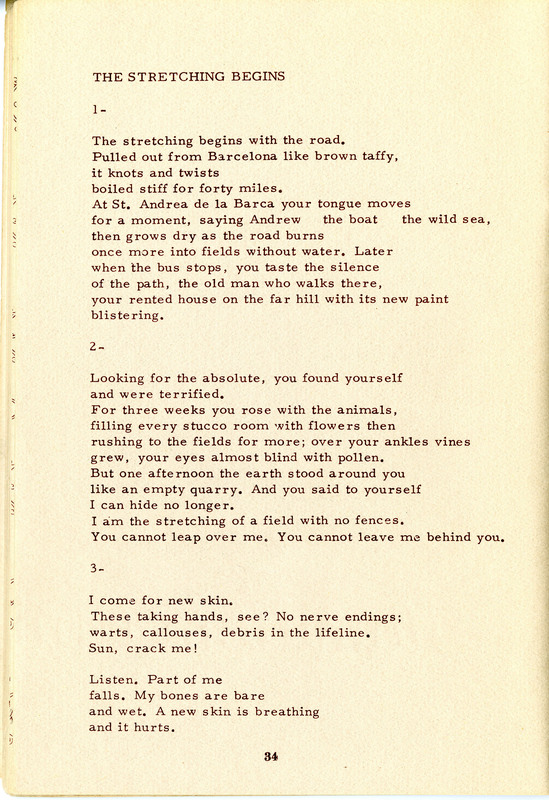 A restless visionary who long advocated for error and improvisation, Kathleen Fraser stands as a unique and indefinable figure in the landscape of post‐war American poetry. 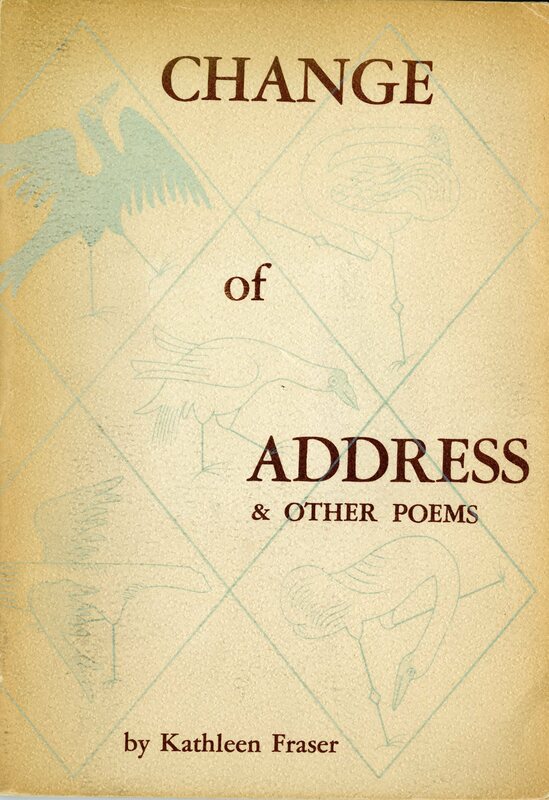 Throughout her career, she relentlessly sought out “the tentative region of the untried,” as predicted by the title of her first collection, Change of Address. Kathleen Fraser passed away on February 5, 2019. 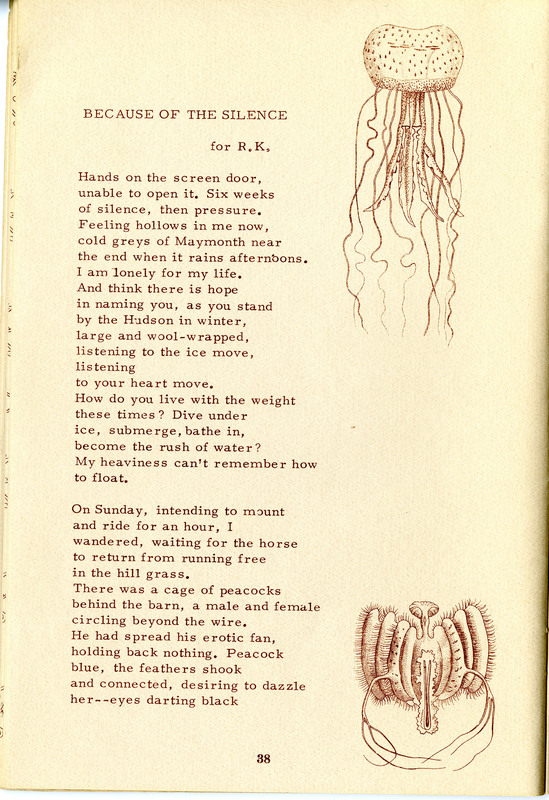 Kayak Books and the journal Kayak were founded by George Hitchcock (June 2, 1914–August 27, 2010) from his home in San Francisco. 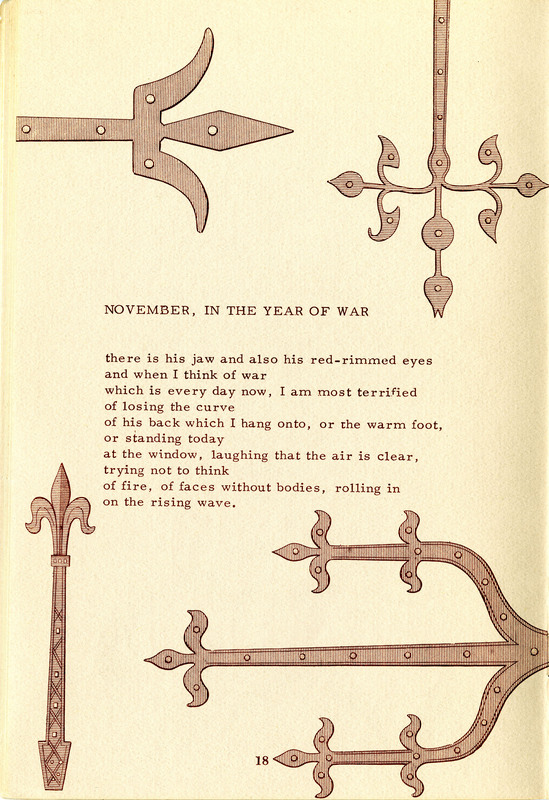 Kayak Books released over 70 books between 1966 and 1978, with titles by poets like Robert Bly, Raymond Carver, Philip Levine, W.S. Merwin, James Tate, Nancy Willard, and Jay Wright. 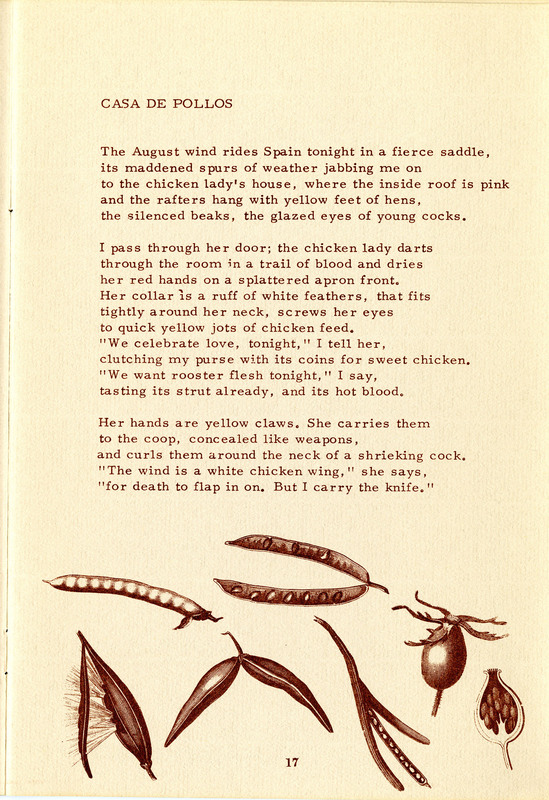 Hitchcock gave a start to many new authors: Kathleen Fraser published her first two books with Kayak Books (Change of Address was her very first), as did Charles Simic. 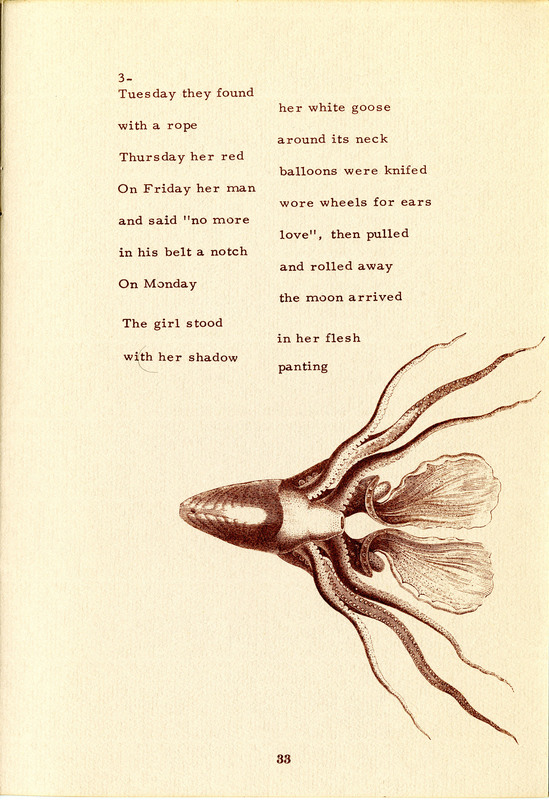 Kayak magazine, which the New York Times called “one of the most distinctive, eagerly read literary journals of its time,” had an even longer run, spanning 20 years (1964–84) across 64 issues and publishing poets such as Margaret Atwood, Wendell Berry, Colette Inez, Yusef Komunyakaa, Sharon Olds, Anne Sexton, and Louis Simpson. 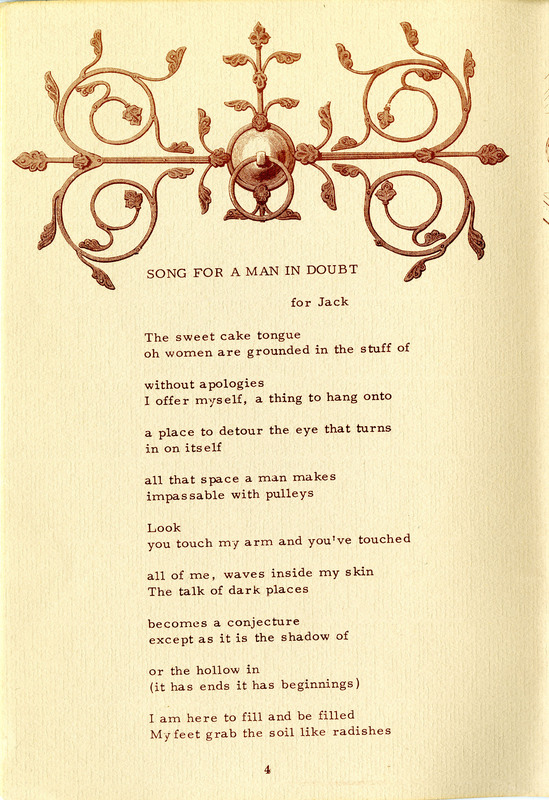 Hitchcock not only edited the magazine issues and books, he also art directed—creating a distinctive look that married contemporary poetry with vintage letterpress printing. 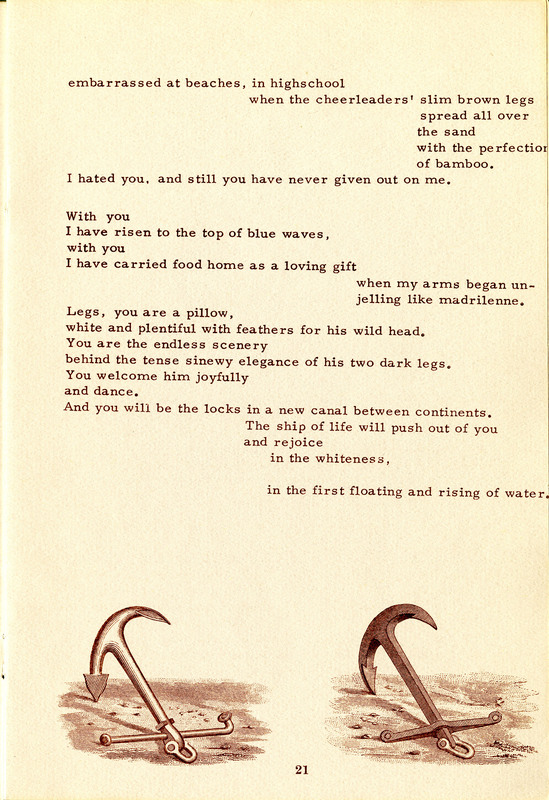 “Kayak visually reflected the freewheeling spirit of its time with whimsical or surreal graphic accompaniment,” noted poet Robert McDowell. 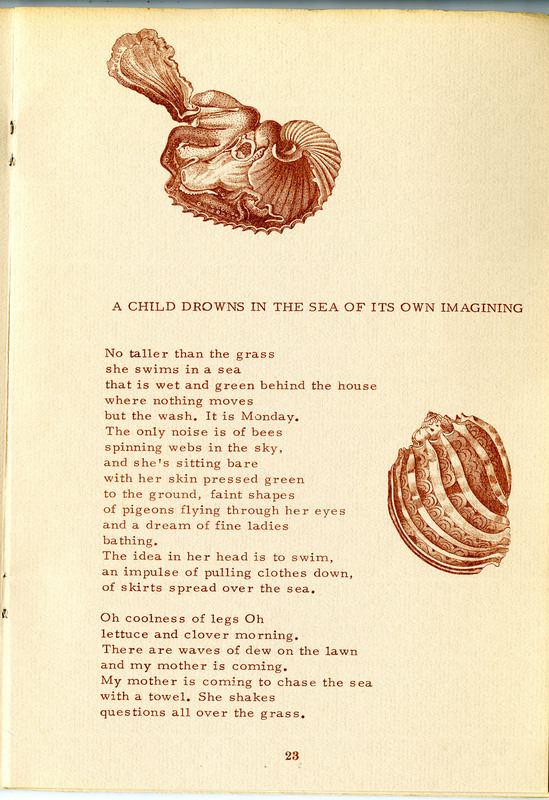 Many of the books employed reproductions of 19th-century engravings collaged in ironic juxtaposition to the poems, as well as surrealist drawings by contemporary illustrators. 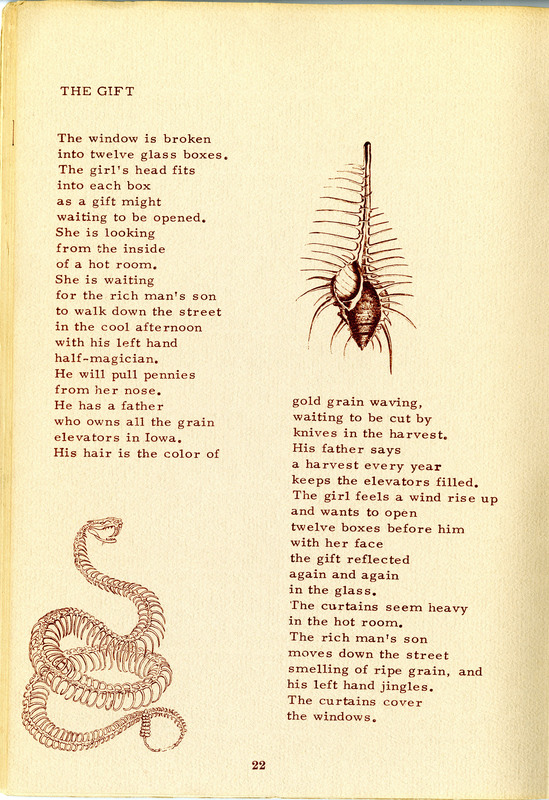 He also featured visual and collage poetry, such as the work of Raymond DiPalma and Margaret Fabrizio. 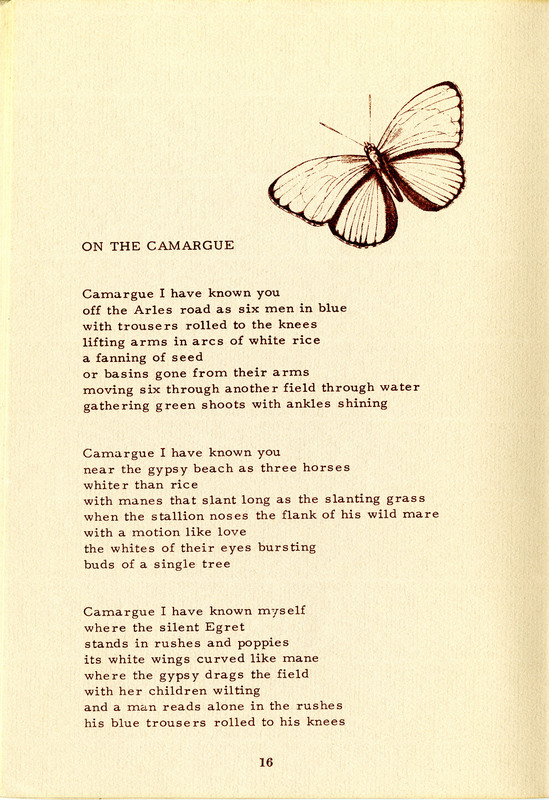 Part of the “Mimeo Revolution” of the 1960s and 1970s, when small publishers proliferated across the U.S., Kayak modeled the notion of small press poetry publishing as a fierce pursuit wrought by singular effort and strong convictions. 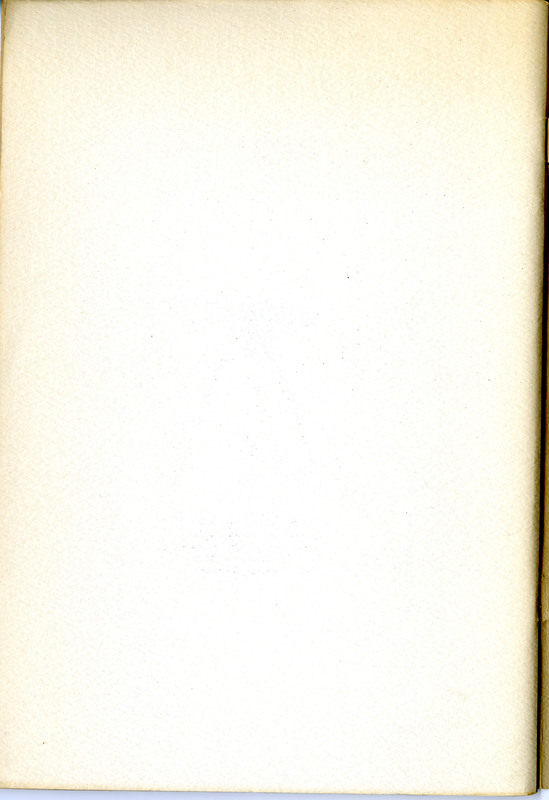 Hitchcock imprinted this motto in each issue of his magazine: “A kayak is not a galleon, ark, coracle or speedboat. It is a small watertight vessel operated by a single oarsman. It is submersible, has sharply pointed ends, and is constructed from light poles and the skins of furry animals. 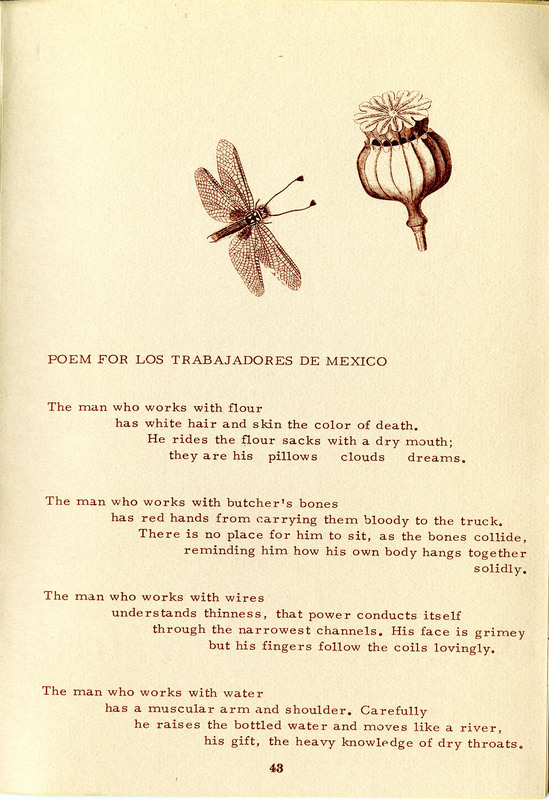 It has never yet been employed as a means of mass transport.” Hitchcock epitomized the ethos of the Mimeo Revolution, eschewing the “mass transport” of popular appeal and instead capitalizing on the benefits of a small‐scale operation to enact a singular, idiosyncratic vision, take risks on new writers, and widen the literary landscape of the 20th century. 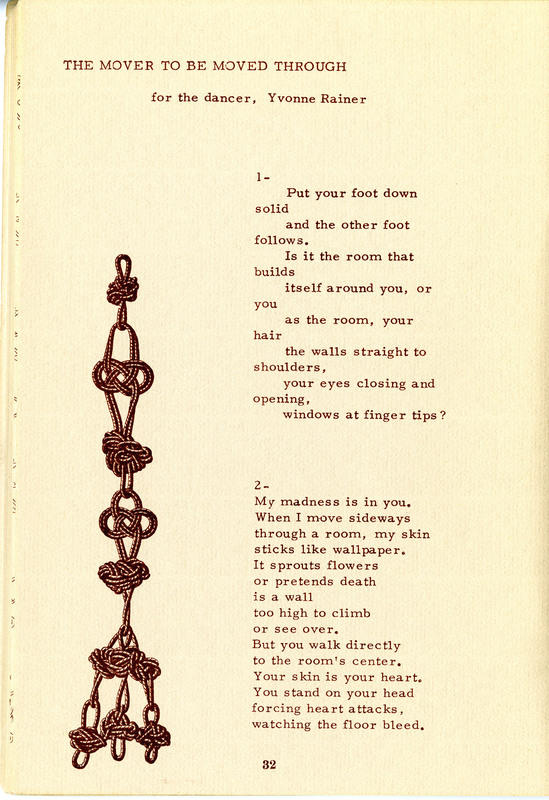 This recording features Kathleen Fraser giving a poetry reading at the Poetry Center with her then-husband, poet Jack Marshall. 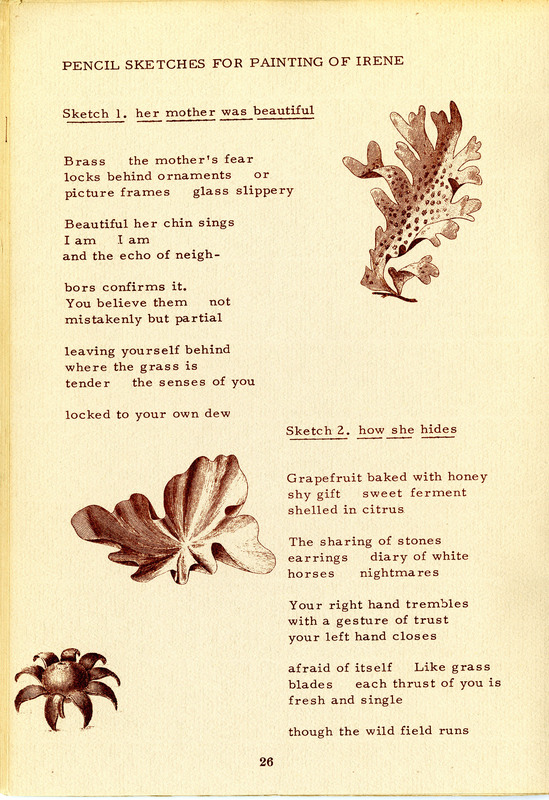 Many of the poems Fraser read on that occasion were from her chapbook Change of Address, and this audio is the source of the recordings that can be heard on pages 3, 14, 17, 20, 35, 38, 44, and 47. 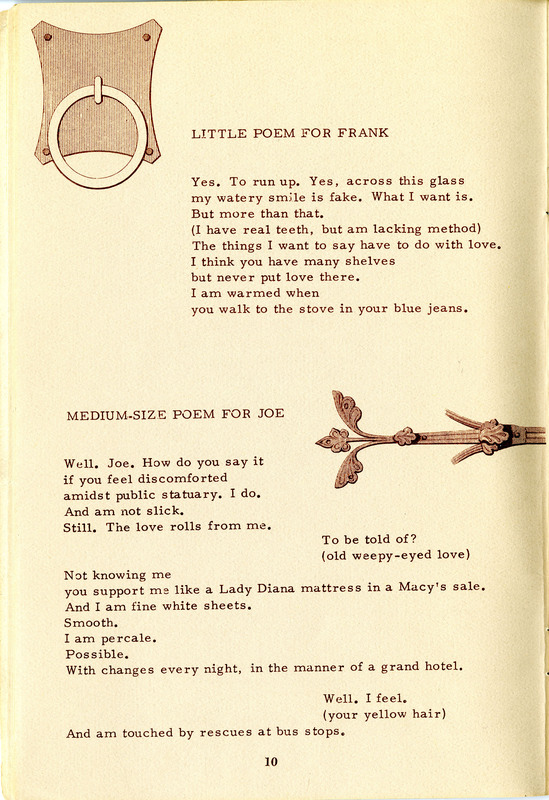 The full-length audio here also includes introductory remarks Fraser made about each poem. 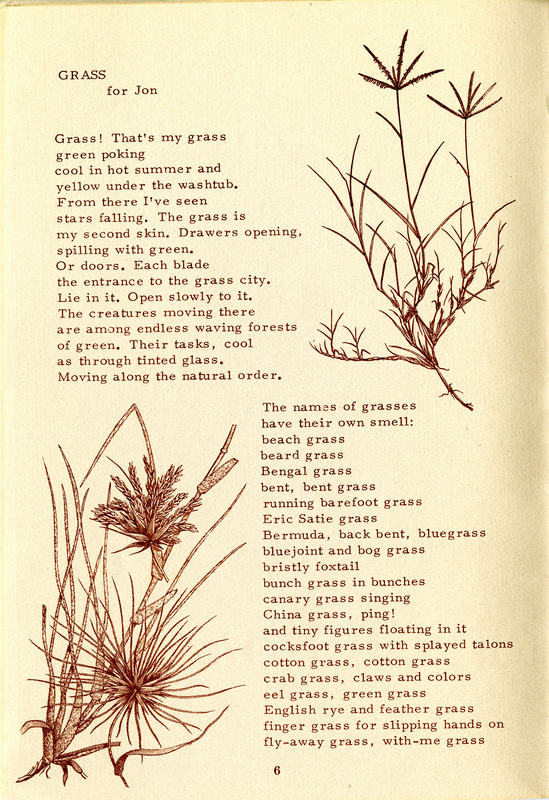 This video features Kathleen Fraser giving a reading and introductory remarks, including discussion of the small-press poetry scene of the Bay Area. Poet and series coordinator Giovanni Singleton introduces the event. Robert Hass introduces Kathleen Fraser.